For more infomation please visit the AKC website. Coming soon possibly May, we have acquired most of the needed equipment and will have a trail in the near future tay tuned……. We do have additional costs and needs you would like to make a contribution please usr the button below. JC or QC: Which one? This is a second article by one of our AKC judges Frank Yeh entitled Selecting a Lure Coursing Test- JC or QC. It explains the difference between the two types of tests you can enter your sighthound in, the JC or the QC. This decision is often very confusing or perplexing for many new exhibitors. In this article Frank gives great explanations of the Junior Courser and Qualifying Courser tests and the rationale for which one you might select for your hound. This article will be especially helpful for new exhibitors and for those of you who are experienced and are mentoring new exhibitors. When you enter your hound for a QC or JC be sure to look carefully at the entry form and check the ‘TEST’ box and then clearly select if you want the JC or the QC. If you select the QC ‘TEST’ be sure that you are prepared to have an experienced hound of a similar running style to be present to run with your test dog. Also be sure to have a blanket/jacket for the test dog. If you need help with either of these be sure to contact the secretary before the event. 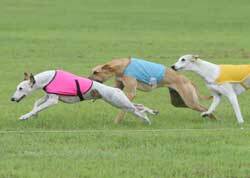 The AKC designates two different Lure Coursing Tests_ Junior Courser (JC) and Qualified Courser (QC). Most people getting started with the sport find this a source of confusion, so this article is intended to spell out the differences between the two types of tests and help people select the appropriate test for their hounds. There are several similarities between the tests. 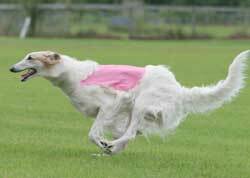 Both tests are meant to evaluate a hound’s prey drive (the hound’s desire to chase prey), which is desirable in all sighthound breeds. Both are run on a course of at least 600 yards with at least 4 turns, and both are judged by a licensed AKC Judge. Hounds have to be at least 12 months of age in order to enter either test and are awarded an AKC title upon passing the tests. To understand how and why they are different, it is important to consider the actual intent of the tests. The JC is essentially a test of the hound’s prey drive while the QC is a test of whether the hound will compete with other hounds safely. People normally enter their hounds in the JC if they are interested in getting a title for their hound but are not necessarily interested in running the hound in competitions. Conversely, the QC is a requirement to entering a hound in competitive Lure Coursing Trials, so people who want to enter their hounds in competitions must first qualify their hounds in a QC test. It’s also worth noting that a hound can earn both titles and that neither test is a pre-requisite for the other. In addition, a JC title requires two successful test runs while a QC title only requires one. So if every title increases a hound’s eminence, why not enter the hound in competition and go for all the titles available to competitive lure coursers? Well, lure coursing is a sport and there are inherent dangers of injury both from the actual running of the courses and in rare cases from other hounds (which is ultimately why the QC test was created). Most people just do not want to take the chance that their champion show dog might be injured in a competitive trial. The chance that a hound running by itself will be injured is considerably lower than when it is running with other hounds, so the JC offers people the safest and easiest way to get a field title for their hounds. When hounds are entered in competition, they are doing just that_ competing with each other to be the one who catches the lure. They are also doing something that is very instinctive for them and in a way connects them to their primal past. So a normally well-mannered hound might become less so when engaged in the chase_ the “thrill of the hunt” is a powerful thing! A sighthound is like a big blood and oxygen pump. When running at speed they experience levels of energy and excitement that nothing else can evoke. This being the case, a hound will occasionally turn on other hounds or interfere with them. Hounds in competition are running at the edge of their capabilities and at high speed even a bump can cause missteps, crashes, and injuries. Less frequently, a hound might even attack another hound competing with it to get to the all-important lure. To minimize the likelihood of injury, the QC test was created to determine whether a hound will run safely in competition. Consequently, the QC test is run with another hound to evaluate how the qualifying hound will react to other hounds on the course. A QC title is now a requirement to enter a hound in its first Open stake. So there are significant pre-requisites involved with entering the QC while the JC is basically a “show up and run” test. If you do intend to enter your hound in competition, there are some good ways to get necessary practice time for your hound. The best thing to do is become part of the local coursing community, getting connected to other coursing enthusiasts through web sites, coursing clubs, or breed clubs. 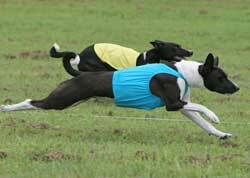 Find out from the community when and where Lure Coursing Tests and Trials or Coursing Ability Tests (lure coursing tests for non-sighthound breeds) are being held and whether the host clubs will be having fun runs at these events. If there are local events for LGRA (Large Gazehound Racing Association – straight line racing) and/or NOTRA (National Oval Track racing Association – oval racing) these present an additional opportunity to run your hound in practice. Both of these organizations post their event schedules on their web sites. In addition to giving your hound the necessary practice, these events will give you a chance to meet other coursing enthusiasts and a chance for them to observe your hound in action_ both of which might be important when you need to find a Testing Hound to run with your hound in its QC test. Note that if you start with straight and/or oval racing it’s still a good idea to get your hound some practice on an actual lure course. It’s sort of funny to watch a straight racer running its first oval when it discovers that the lure can actually turn or an oval racer in its first lure course when it finds that the lure can also turn right. Whether you decide to go with the JC or the QC or both, you are in for a thrill watching your hound doing something that thousands of years of evolution have shaped it to do. It’s a uniquely beautiful, amazing experience augmented by the feeling you will get when you see how contentedly your companion sleeps when you get home. Earlier this year Della passed away, she had an unyielding dedication to CAT’s Lure Trials among other AKC events. Della had vast knowledge of the sport and was always more than happy to chat with any exhibitor new or long term attendee. In short to those who know Della she will be greatly missed. Della’s memory will live on whenever you hear tallyho. In March of this year some of our Coursing Freinds left the field and walked the red carpet (after a bath of corse) at the Beverly Hills Kennel Club. On Easter Sunday, April 16 at 8/7c, USA Network will air the inaugural telecast of the Beverly Hills Dog Show Presented By Purina. Click Here to watch the show. Honorable mention to Ziva, even know she is now retired it did not stop her from hitting the red carpet at Universal Studios and going for a walk with Bart & Homer (from the Simpsons). She participated in a production to promote the Beverly Hills Dog Show Presented By Purina. A ❣SPECIAL THANK YOU❣ to Justin Dannenbring, Vickie Bellitto and Jennie Skoglund for setting up the GoFundMe page. The out pouring of generosity, prayers, thoughts and well wishers from CCA, the Coursing community and friends,,,,,was SO overwhelming❣ You have ALL Touched mine and Laci’s 🐕❤️Heart! With every thank you that I wrote, I had tears because, this moved me in a way that will stay with me forever. run in today after coursing was over. I am still in awe, from the overwhelming responses.